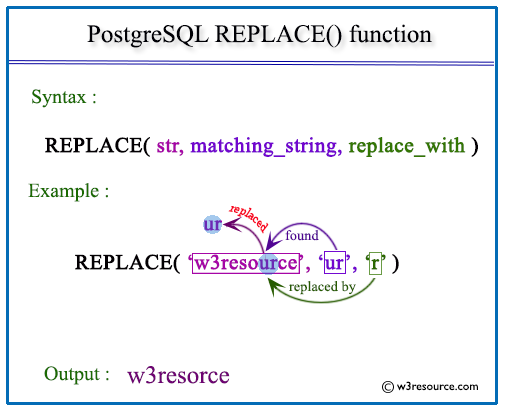 The PostgreSQL replace function is used to replace all occurrences of matching_string in the string with the replace_with_string. In the example below, the specified string 'st' have been replaced by '**' in the string 'test string'. If we want to display the employee_id, job_id and a formatted job_id which is including '***' instead of 'VP' from employees table for those employees, who drawn a salary of more than 15000 , the following SQL can be used.